Saint Theoctist (Feoktist), Archbishop of Novgorod, a good and humble man, prior to becoming a bishop, was abbot of the Annunciation Monastery near Novgorod. 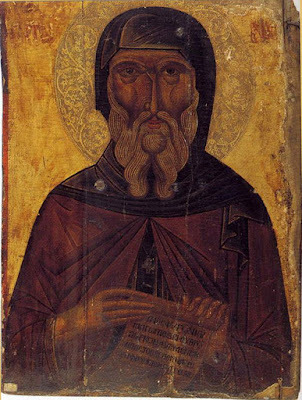 After the death of Archbishop Clement in the year 1300, the people of Novgorod chose him as their Archbishop, and Metropolitan Maximus with the bishops Simeon of Rostov and Andrew of Tver consecrated Saint Theoctist as Archbishop of Novgorod. One of Saint Theoctists’ concerns was the renovation and building of churches. 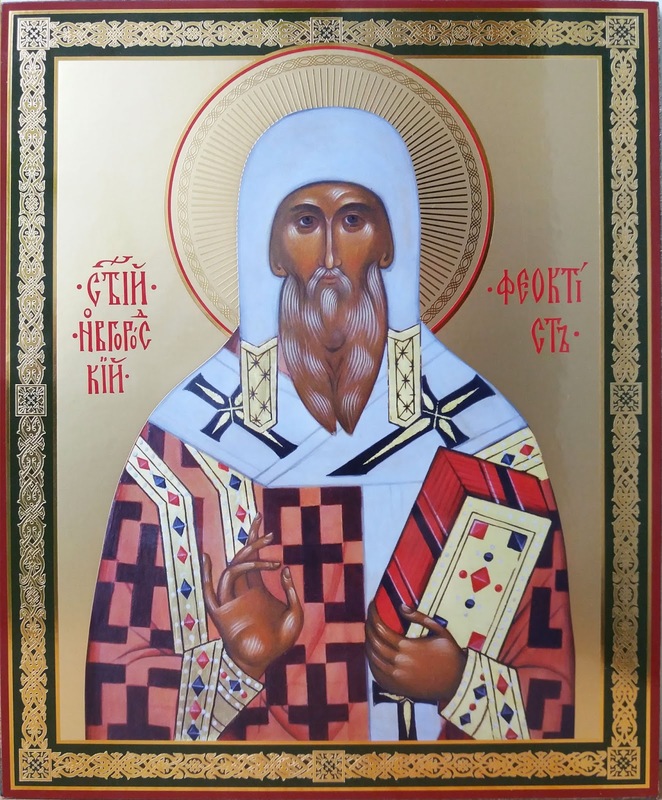 He consecrated cathedrals in the name of Saints Boris and Gleb, and in the name of the Holy Fathers of the First Ecumenical Synod. The Monastery of Valaam was set in good order during his time. Furthermore, the Saint was known for acting as a mediator in the conflict between Prince Michael of Tver and Novgorod, an agreement between them was recorded in the Theoctist Charter, with the signature and seal of the Archbishop. In the year 1307, because of poor health, the Saint withdrew to the Annunciation Monastery, where he lived until his death in 1310, devoting himself to the ascetic deeds of silence and prayer. Saint Theoctist was glorified in 1664, because of the miraculous healings at his tomb. 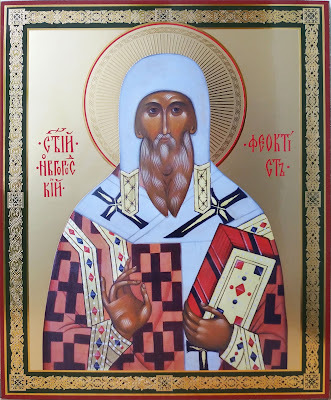 In 1786, the relics of the Saint were transferred to Yuriev, where Archimandrite Photius built a chapel in his honor at the local Cathedral of Saint George. 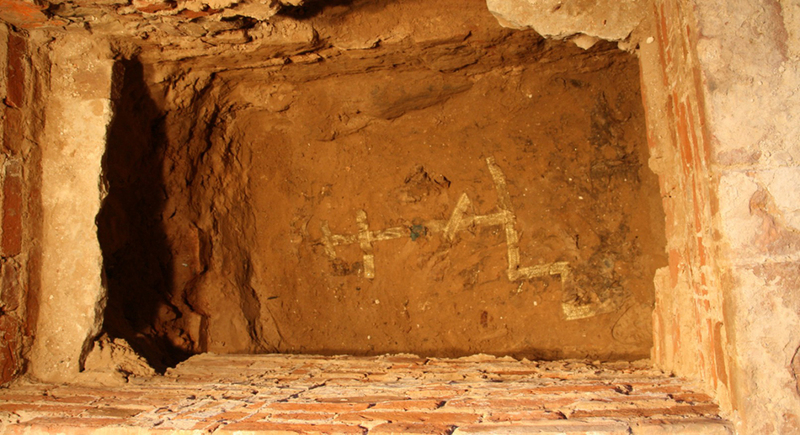 In 2013 the expedition of the Institute of Archaeology started excavations in Saint George’s Cathedral. Upon agreement with Metropolitan Lev of Novgorod, two sections were selected for survey boreholes, i.e. one section in the middle apse and the other section in the north cross arm of the cathedral. The first section was selected to determine the stratigraphy of the fills for the floor and presence of ancient constructions while a grave of Theoctist, Archbishop of Novgorod, whose remains were transferred to the cathedral from the suburban Annunciation Cathedral of Novgorod in 1786, was planned to be searched in the second section. The excavations revealed the original floor level and the base of the ancient altar preserved in the middle apse of the cathedral. A large number of fresco fragments were identified in the fill for the latest floor; ornamental fresco compositions were discovered on the cathedral wall beneath the latest floor level. A tombstone above the grave of holy Theoctist that marks with confidence his burial place considered ‘lost’ in the course of alterations and refurbishing carried out in the 20th century was found in the north cross arm of the cathedral. The relic was placed in the church for veneration until excavations are completed, then they will be returned.